Peanut butter and Jam Chocolate Cups ingredients and supplies set up. A while ago I watched Creativebug's video, "Homemade Dark Chocolate Peanute Butter and Jelly Cups" and was excited to try making my own. Mark and I gathered the ingredients and supplies and put everything out on our kitchen island. We used Ghiradelli chocolate chips, smooth peanut butter, graham crackers, confectioner's sugar, and jam. We used apricot jam in half the chocolate cups and strawberry jam in the other half. (We both liked the cups with apricot jam better, but it is a personal preference. Use your favorite type of jam.) We made a half recipe, and it made about 16 cups. We lined a large cookie sheet with parchment paper to protect the sheets from jam and messy melted chocolate. I found mini paper cupcake liners at Michaels. We used them for the chocolate cup molds and laid them out on the parchment sheet. The graham crackers were crushed in a food processor. Then we mixed the crushed graham crackers, the peanut butter, and the confectioner's sugar together for the peanut butter filling. This made a soft, shape-able filling that we formed into little patties. The chocolate chips went into a Pyrex bowl and then into the microwave for melting. We did short microwave times of about 30 seconds each, taking the chips out to stir after each microwave session, and were careful not to burn the chocolate. When the chocolate was melted, we used little pastry brushes to brush the chocolate onto the insides of the paper cupcake liners. We covered the bottoms and sides with the melted chocolate and then turned the liners upside down on the cookie sheet so the chocolate could run up the sides and thicken the walls. 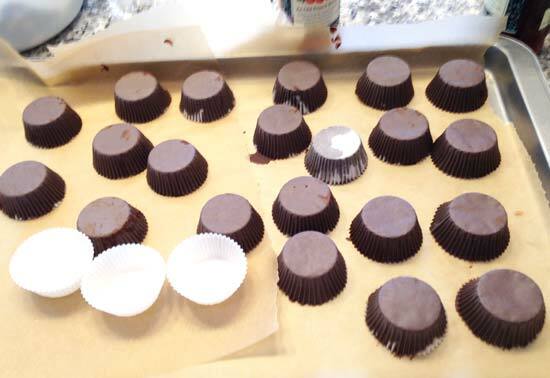 Peanut butter mixture and jam filling added to hardened chocolate cups. Then we used the pastry brushes again to cover the filling with more melted chocolate. 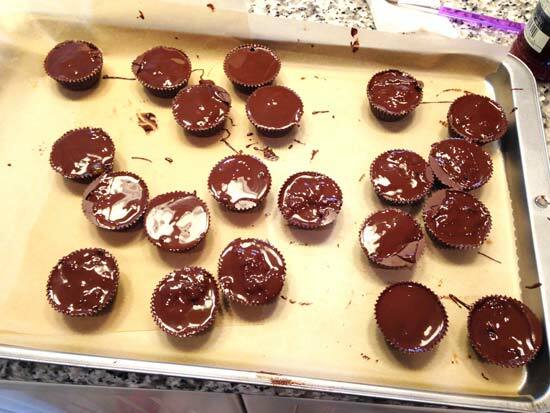 We were careful to go all the way to the edges, so the fillings would be well encased inside the chocolate cups. Melted chocolate brushed onto chocolate cups. 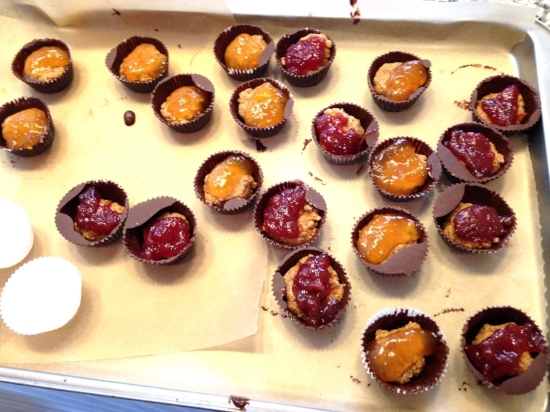 The peanut butter and jam chocolate cups were seriously yummy! But the chocolate wasn't tempered, so it started to melt while you were eating it and had to be kept in the refrigerator. Jacket WIP trying on. Sleeves are longer to fit Sophie. I found a beautiful free download faux fur jacket pattern by Design by Lindsay and decided It would be perfect as a starting point for the jacket I had in mind. I showed it to Sophie. She loved it and asked if she could have it in the same fabric. I was surprised to find the fabric was still available through fabric.com. I found some soft, lovely dusty pink Bemberg rayon at Mood and some covered Dritz hooks and eyes at Jo-Ann. I set the printer to print at 100% for the size and printed out the pattern. I lengthened the jacket a few inches, flared the sides seams to be slightly A-line shaped, and raised the neckline to be a regular round neck. I added side pockets and made them out of the lining fabric. I also added covered hooks and eyes so the jacket could be worn closed. Rayon lining pockets added to jacket side seams. I cut out the fabric using an x-acto knife cutting from the back and carefully going only through the backing fabric so I didn't cut any of the fur pile. I sewed the body and lining separately and then sewed them together using a jacket bagging technique Threads has a clear tutorial for bagging a jacket lining here. My teddy bear sewing experience came in handy when constructing the jacket, as it is working with fur fabric pile. I used an embroidery needle and my bunka brush to pull the fur out of the seams on both the inside and outside of the jacket. I trimmed all the fur out of the seam allowances and used a catch stitch to flatten and hold all the faux fur seam allowances and sleeve and garment hems against the outer fabric. You can see a detailed catch stitch tutorial on the Craftsy blog. Catch stitched shoulder, arm, and neck seams. I closed the opening in the hem created when I bagged the lining. Lastly I hand sewed the five covered hooks and eyes to the front opening of the jacket. Done! Covered hooks and eyes in process of hand sewing to jacket front. 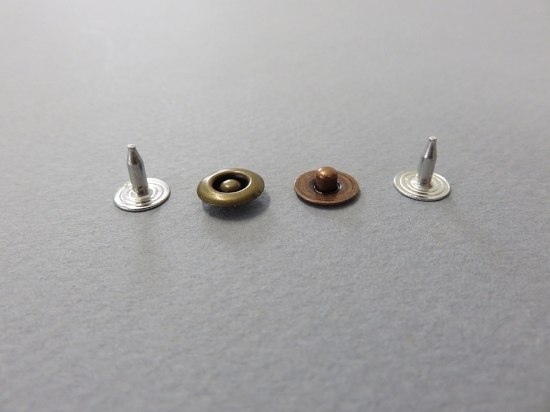 (some pins still visible. Sophie loves her faux fur jacket. For my first pair of jeans, I checked out various jeans patterns on the internet and picked Morgan Jeans by Closet Case Patterns. I love the boyfriend style and Closet Case Patterns has a reputation for such quality patterns. I made the jeans for my daughter, Sophie. Making the jeans was a big project. I took Heather's "Sew Your Dream Jeans" online course and it was a wonderful class. The class is a video course, and she goes step by step so you see the whole process. She goes into a great deal of detail, and covers tips for getting a good fit, goes carefully over any difficult or confusing construction techniques, so the class is very easy to follow. I highly recommend the class. Something I did that was helpful to me was to use Wash-away Wondertape for temporarily gluing down the turned under back pocket facings and seam allowances for sewing the pocket top stitching and then for holding the pockets in place for sewing to the jeans back. I used a Hong Kong seam finish for the raw edge of the fly shield and a vintage flower cotton for the front pockets. Last year I taught Renegade sewing at our homeschool co-op. There were six teenage girls in the class. We deconstructed and reconstructed t-shirts to make clothing and accessories and constructed our own fabrics from cotton scraps that we then made into bags. The girls started out with a little knowledge of sewing, and fearlessly dove into their projects. We didn't use any patterns in the class, but found wonderful inspiration in the book, Generation T: 108 Ways to Transform a T-Shirt by Megan Nicolay. The girls had a great time and the finished projects were inspiring.